Bees are our friends. Sure, they’ve been prominent villains in bad movies such as The Swarm. And yes, some of us (like me) are deathly allergic to them. But let’s face it: Bees do us a big favor by pollinating plants, which allows us to enjoy those little luxuries in life such as food. Alas, the little black and gold insects are threatened. 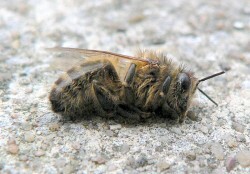 It appears they are being killed off by a type of pesticide called neonicotinoids. (Notice a familiar, cigarette-related word there? Yes, neonicotinoids are based on nicotine.) Made by corporate giant Bayer and sold under brand names such as Clothianidin and Imidacloprid, these pesticides are used on crops of soybeans and corn. According to the New York Times, these pesticides “permeate all of the plants’ systems,” leading to bees and other pollinating insects absorbing the poison and carrying it back to their hives or nests. This is bad news for the bees. The Environmental Protection Agency knows it, but hasn’t done anything about it yet. The livestock industry is nothing if not wily when backed into a corner. Just look at what’s happening in Washington state. Washingtonians for Humane Farms have started a signature drive to put an initiative on the state ballot requiring egg producers to provide each egg-laying hen with at least 1.5 square feet of space, enough to allow her to extend her wings fully and turn around freely. 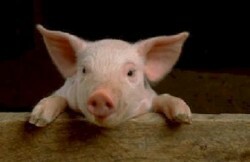 The measure, called the Prevention of Farm Animal Cruelty Act, has been assigned the number 1130. Even though no one has had the chance to vote on the measure yet, Washington poultry concerns have already responded by introducing their own, watered-down bit of legislation. 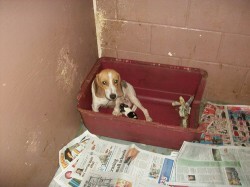 SB 5487 pretends to be an animal welfare bill. Really, it just introduces some minor improvements, and doesn’t go nearly far enough, or as far as 1130. 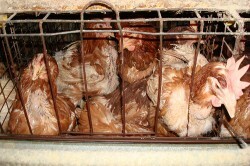 Essentially, it just codifies the practice of battery cages, and requires new cages to be just a little larger. Notice the word “new.” Only those cage systems installed after August 1, 2011 would be affected by SB 5487. Just what the fading jewel of the New Jersey seashore needs: a big dose of animal cruelty. Yes, the rodeo has come to Jersey. At first, it’s a puzzling development. After all, New Jersey isn’t exactly known for its cowboys and ranches. 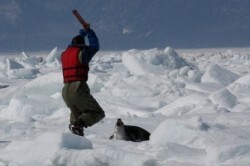 Places like Alberta, Canada, at least have some sort of historical rationale for their own festivals of animal abuse. 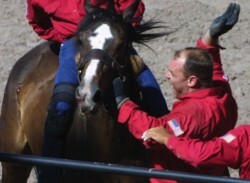 The new Atlantic City rodeo is — like most animal cruelty — a result of pure, unadulterated greed. You see, it seems the casinos just aren’t doing so well. According to the AP, “revenue in the nation’s second-largest gambling market fell by 6.7 percent in March, the second straight month the decline was measured in single digits.” So, in a desperate money-grubbing venture, all the Atlantic City casinos colluded to launch the Atlantic City Boardwalk Rodeo. Canada is a pretty progressive country, except when it comes to animals. Whether it’s the continued slaughter of seals, the Canadian horse meat industry, or the celebration of cruelty known as the Calgary Stampede, Canada (like all nations) could certainly do more to help make things better for animals. Yet change has been slow coming, and proposed changes to Canadian tax laws could slow down things even more. Greyhound racing is big business in Ireland, generating €500 million, or about $711 million, a year to the Irish economy. Greyhound exports alone are valued at €40 million (about $56 million) a year. 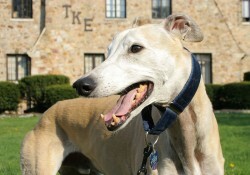 Ireland exports greyhounds to nations such as the U.S., Continental Europe, Australia, and Pakistan. Drs. Martin and Barbara Wasserman may both be graduates of Johns Hopkins School of Medicine, but loyalty to their alma mater doesn’t trump the Wassermans’ concerns about animal cruelty at the illustrious institution. According to CBS Baltimore, for five years they have been trying to get Hopkins to do away with animal labs, with no success. In a landmark ruling, a U.K. judge has ruled that a belief in animal rights is a philosophical belief akin to religion, and thus deserves protection under British employment law. 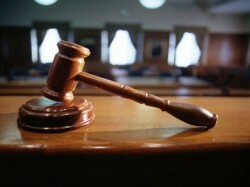 The judgement stemmed from a lawsuit filed by a gardener named Joe Hashman. Hashman lost his job at Orchard Park Garden Center, of Gillingham, Dorset, over his philosophical objections to bloodsports. His tireless anti-hunting activism didn’t sit well with his employers, Sheila Clarke and Ron Clarke, who are keen supporters of foxhunting. Hashman’s efforts on behalf of animals eventually led to his dismissal. The catalyst appears to be the conviction of celebrity chef Clarissa Dickson-Wright for illegal hunting in 2000. Dickson-Wright, former co-host of the cooking program Two Fat Ladies, was convicted of attending two hare-coursing events in March 2007. Hare-coursing, according to The Times, involves hares being “driven by beaters into a field to be chased by greyhounds,” and was outlawed under the Hunting Act of 2004. Saturday, March 5th, is the start of the Iditarod Trail Sled Dog Race. Race organizers describe it as a “race over 1150 miles of the roughest, most beautiful terrain Mother Nature has to offer.” I describe as a way to exploit dogs and get them killed in the name of humanity’s obsession with sports. Like all animal exploitation as entertainment, the Iditarod Trail Sled Dog Race has no place in modern society. Yet plenty of corporations are perfectly willing to line up and shell-out money to sponsor the thing. One of these corporations is Target, which courts a hip, progressive demographic, while at the same time funding gay-bashing conservatives. 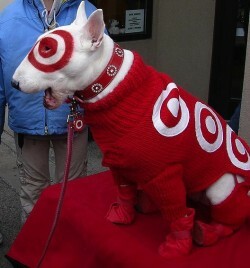 And despite their canine mascot, Target sponsors something called the “Iditarod Teacher on the Trail” program. In doing so, they are also sponsoring the abuse and possible deaths of countless dogs. Is it okay for dogs to suffer injury and death just so people can watch them run around a track and promoters can make some cash? In West Virginia, apparently so. 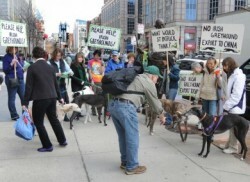 “In terms of the raw number of injuries, this is the largest we have seen for a single track by far,” said Carey Theil, executive director of GREY2K USA, a Massachusetts-based nonprofit working to outlaw greyhound racing.